Growing up in the church, Easter hymns have been some of my favorite church memories. After all, celebrating the resurrection of Jesus Christ is the biggest thing to get excited about as a Christian! 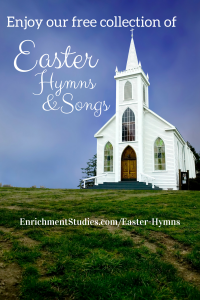 This year I’ve compiled a collection of both classic and contemporary hymns and songs about the Easter season, in hopes that you and your family will enjoy humming and singing along as much as I have. In addition, I’d like to share with you our collection of Easter art to use in your home as you focus on this Resurrection season. Just use coupon code EASTER to make it free! 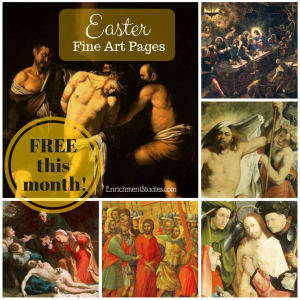 Be sure to check out the How to Use Fine Art Pages in Your Home bonus that’s included with your Easter art. That will help you get off to a great start. You’ll also get a FREE membership to our Subscriber Perks program, where you’ll receive a freebie every month, heart-to-heart encouragement for homeschool moms, special offers and discounts, and more! When I Survey the Wondrous Cross: Original words written by Isaac Watts in 1707. Beautiful nature images accompany this traditional singing of this hymn. The Old Rugged Cross: Beautiful harmonization! There is Power in the Blood: Alan Jackson. If you enjoy country music, you’ll like this one. An example of spoken word poetry from way back in the 80s! Who remembers Carman and The Champion? Pretty cool stuff. Jesus Messiah by Chris Tomlin. A newer praise style song that is perfect for Easter.